Toolroom Records recently announced their plans to celebrate the label’s 10th birthday. 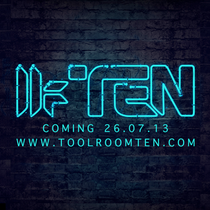 Toolroom Ten will run over the ten-week period from the end of July until the start of October and the label has a host of activities planned, including a ten date city tour, an album featuring the best of Toolroom’s releases, singles from their new breed of artists, as well as classic Toolroom tracks remixed. The label will also showcase a dedicated microsite containing interviews and features looking back at the last ten years of dance music. It will also countdown to the label’s grand finale weekend at Ministry of Sound on 4th and 5th October! The birthday celebrations are very much aimed at full fan engagement in reaching this milestone and there will be loads of opportunities to get involved in the campaign as it unfolds. Over the next few weeks Toolroom will be gradually announcing more details, but you can sign up to www.toolroomten.com now to be the first to hear more. The album ‘Toolroom Ten’ launches on July 26, but is already available for pre-order on iTunes. It features 100 of the best Toolroom tracks for £9.99, plus three mixes from label boss Mark Knight and a written history of the label.